It’s do or die time for Minnesota’s Second Amendment supporters. The Tuesday, November 6 mid-term elections are only days away, and — without your IMMEDIATE action — I’m worried we’ll be staring straight at a gun control DISASTER. And there’s one candidate above all others the Gun Control Lobby is hoping to take out. That’s perhaps the strongest pro-gun candidate in all of Minnesota, Erik Mortensen (R-Shakopee). 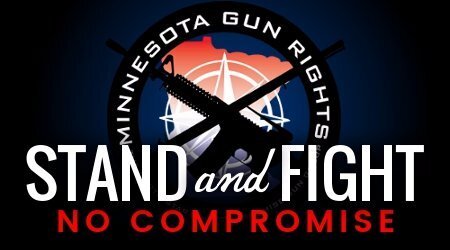 Will you please agree to a generous EMERGENCY contribution of $200 to help Minnesota Gun Rights keep our ads running in Shakopee through Election Day? Or, if that’s not possible right now, could you at least do $100, $50 or $25? As you may know, candidate Erik Mortensen has been sounding a pro-gun battle cry throughout his election campaign promising to champion MAJOR pro-gun reforms like Stand-Your-Ground and Constitutional Carry! He’s promised to not just pay lip service to the Second Amendment, like to many other so-called “pro-gun” legislators do, but to FIGHT to pass pro-gun bills and to stop any and ALL gun-control bills! But all that will go up in smoke if the gun-grabbers get their way. As you may have seen, Jeff Johnson is trailing anti-gun Democrat Tim Walz. Gun-grabbers also believe they may have a shot of seizing the Minnesota House as well, depending on turnout on Election Day. But regardless of whether or not they do, they want to see Erik Mortensen DEFEATED to send the message to all other legislators. They believe if they can DESTROY Candidate Erik Mortensen, other legislators will start thinking that supporting gun rights is bad politics — and will start cozying up to Michael Bloomberg on issues like so-called “Red Flag” Gun Confiscation Orders! That’s why — as soon as I got a whiff of this scheme — I authorized Minnesota Gun Rights’ staff to launch an all-out ad blitz in Erik Mortensen’s district. Every one of our ads calls out Erik Mortensen’s opponent, former Shakopee Mayor Brad Tabke, for his radicalism. You can see a sample of that ad, here. During his campaign, he has brazenly called for “Universal Gun Registration”, “Red Flags” gun seizures, a ban on bumpstocks and standard capacity magazines and more! He’s also promised to fight AGAINST Stand-Your-Ground law if he makes it to St Paul. I’m worried the anti-gun “blue wave” our national media has been cheerleading for since the day President Trump was sworn in could swamp Minnesota. That’s why I’m prepared to do more than EVER before to stop this gun control train wreck. The bad news is, I don’t have the money in the bank to see all of this through and keep our ads on the air through Election Day — either in Erik Mortensen’s District or any other of our top targets. As pro-gun patriots like you have sent in generous contributions, I’ve spent every dime I’ve been able to almost immediately. Now, I’m worried I won’t be able to see all of our programs through, and I’ll have to cut back right when Minnesota citizens are most “tuned in” to their races for State House. If you possibly can, please give. $200 if you can. More if it’s at all possible. Or if that’s just too much, please give $100, $50 or at least $25. Our backs are against the wall. We either FIGHT BACK — or watch our allies get pummeled. P.S. 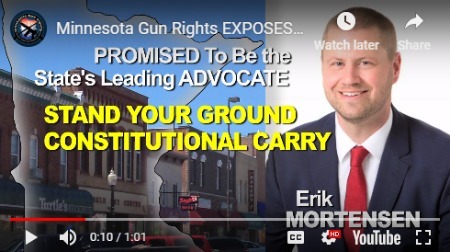 Gun-grabbers are going all out to seize control of Minnesota if they can, and to punish pro-gun candidates like Erik Mortensen if they can’t. We have to STAND and FIGHT BACK!